Quality data originate in the field, and quality maps begin with boots on the ground. 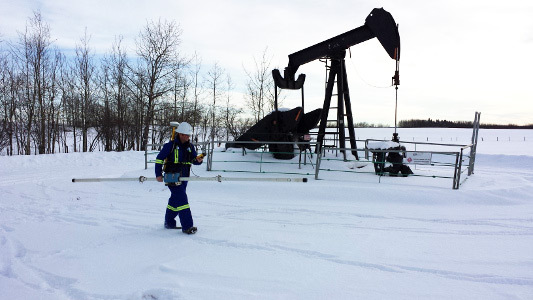 Our field crew consists of project scientists with years of field experience in the oil and gas, and agricultural sectors. Cascade Imaging Solutions only employs the most determined and motivated personnel that will go the distance to get results in adverse weather and site conditions. An important aspect of delineating anomalous regions during a survey is closure. Closure means that the surveyed area is extended in all directions until background (i.e. naturally occurring) levels are attained. Closed anomalies yield complete images of the impacted areas. Obtaining closure necessitates entry into areas and vegetation not accessible by ATV. Therefore, our geophysical surveys are conducted on foot for maximum quality. Instrument responses are also easier to interpret when approaching linear features (roads, pipelines, ditches, etc.) perpendicularly due to electromagnetic coupling and imaging effects. This is another reason surveys conducted on foot produce better quality images than surveys conducted by ATV. We produce preliminary maps instantaneously in the field. This allows for immediate sample targeting and investigation. The maps are georeferenced for instant positioning on mobile devices. Our geophysical instruments are GPS synchronized for rapid data acquisition and images are immediately generated in-field. GPS synchronized geophysical data are imported into a Geographic Information System (GIS). GIS software allows the information to be georeferenced and graphed. Gridding algorithms interpolate levels between sample points to produce an image. Measurements are expressed as a scale of intuitive hot and cold colours. The colour white is used for low-end responses that represent background (i.e. naturally occurring) values. Maps are projected in Universal Transverse Mercator (UTM), so that distances are expressed in meters. These features make the maps easy to interpret and georeferencing allows for instant positioning on mobile devices. Site features are surveyed, drafted and included as an overlay on all maps. We also overlay sample points and walking lines to facilitate interpretation. Electromagnetic responses depend greatly on the orientation of the instrument with respect to the anomaly, in cases of buried metals and pipelines. This is important for another reason: sample density is a major factor in the gridding algorithms that determine image quality. Geophysics is an earth science that evaluates physical material properties to infer subsurface conditions. There are several geophysical techniques, which exploit different properties. Every method has strengths and weaknesses associated with the physics that tailor to specific applications. Selection of the appropriate geophysical approach depends on the objective. 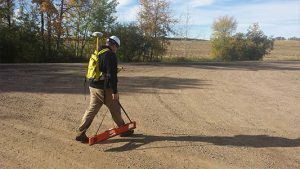 Our surveying procedure couples geophysical measurements with positional data, facilitating powerful imaging processes. The technology offers rapid data acquisition and instantaneous results. 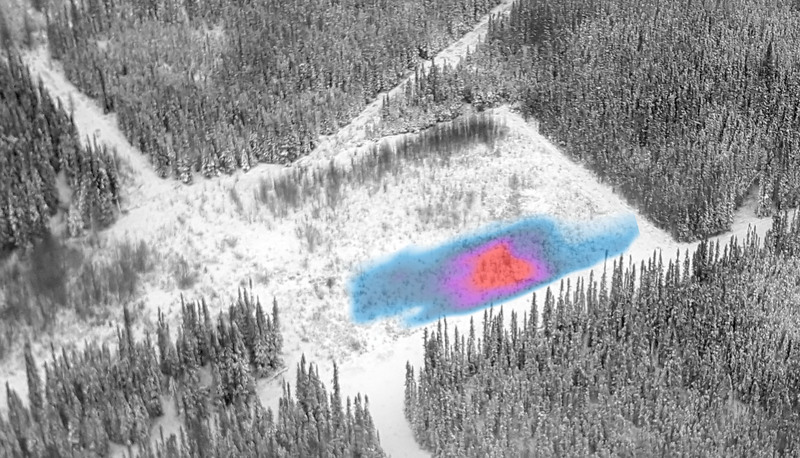 Target zone identification allows accurate analytical follow-up work to confirm geophysical findings. We specialize in the delineation of ionic contamination (i.e. salts). Ion concentrations relate to soil conductivity that can be determined with frequency-domain electromagnetic induction methods, also known as EM surveying. 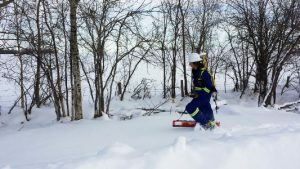 There are a variety of other geophysical methods suitable for a wide range of applications including environmental, exploration, and agricultural investigations. 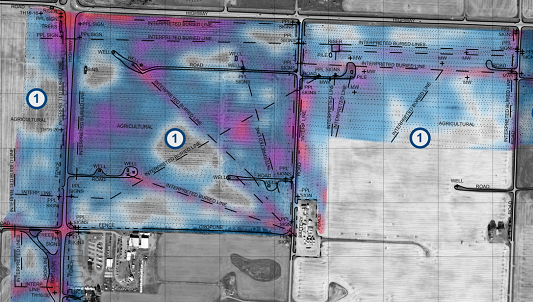 Proper geophysical method selection ensures target zones can be located and identified. Subsurface ion concentrations (i.e. salts) greatly affect soil conductivity. As such, distributions of conductive soils can be delineated with frequency-domain electromagnetic induction methods, also called EM surveying. In oil and gas applications, ions tend to migrate further than associated hydrocarbons. Therefore, maximum impact extents can usually be determined with an EM survey. A transmitter coil in the instrument emits an alternating electromagnetic field that induces eddy currents in the ground. Subsurface eddy currents produce a secondary electromagnetic field coupled to the primary field. Secondary field magnitudes are measured by a receiver coil that relate to bulk subsurface conductivity and indirectly correspond to ion concentrations. The Geonics EM31 is a frequency-domain electromagnetic geophysical instrument designed to measure bulk soil conductivity, also known as apparent conductivity. The instrument has an effective depth of penetration, or skindepth, of approximately 5.5 meters, and is often used in conjunction with the Geonics EM38 to obtain generalized depth information. The instrument has a deeper skindepth than the EM38, and a larger footprint. As such, the tool will detect deeper ion concentrations but will produce lower resolution maps and is prone to interference from nearby electrical sources and metal infrastructure. The Geonics EM38 is a frequency-domain electromagnetic geophysical instrument designed to measure bulk soil conductivity, also known as apparent conductivity. The instrument has an effective depth of penetration, or skindepth, of approximately 1.5 meters, and is often used in conjunction with the Geonics EM31 to obtain generalized depth information. The instrument has a shallower skindepth than the EM31, and a smaller footprint. As such, the tool will not detect deeper ion concentrations but will produce higher resolution maps and is less prone to interference from nearby electrical sources and metal infrastructure. There are two positioning satellite constellations in operation with worldwide coverage: the US Global Positioning System (GPS) and the Russian Global Navigation Satellite System (GLONASS). Either network is capable of sub-decimeter accuracies when differentially corrected for ionospheric effects. Our rovers utilize and correlate both systems providing highly precise geographic positioning and redundancy in low signal areas. Nearby base stations supply differential correction data that broadcast in real-time via satellite to our receivers. Differentials measure the positional drift due to transmission delays in the ionosphere. Streaming differential telemetry eliminates post-survey processing and ensures immediate accuracy. The positional receivers are synchronized with our geophysical instruments. 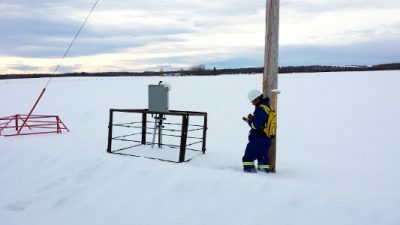 Geophysical measurements are automatically paired and recorded with real-world coordinates. Data acquisition is precise, efficient, and readily uploadable for instantaneous in-field map creation. Georeferencing refers to the process of embedding geospatial coordinates into digital image files. It relates aerial, satellite or geophysical imagery to geographical positioning. At Cascade, we use GIS software to produce georeferenced maps in PDF format (GeoPDFs) for use with mobile device applications. 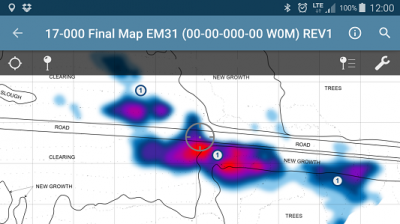 Users can pinpoint their location on our maps through the GPS on their mobile device, facilitating rapid and accurate target identification without relative measurements to local surface features. 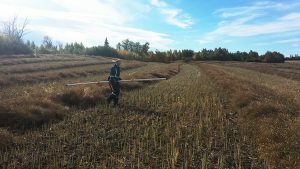 We therefore make georeferenced field maps available immediately after survey completion so sampling and coring can proceed as soon as possible. Aerial photography is the production of images from an aircraft platform, such as an airplane, helicopter or drone. The term sometimes includes photography from artificial satellites as well, though the two methods differ somewhat in cost, resolution and update frequency. The technology is primarily intended for geographical cartography and reconnaissance but also has many geophysical applications. A process called orthorectification removes perspective distortions that are a by-product of camera optics by projecting the images onto a flat surface of uniform scale. Orthophotos permit georeferencing for use in mapping applications and GIS software. A useful application of aerial photography for presenting geophysical findings is to overlay geophysical images on top of the aerial photograph. The relationship between geophysical results and subtle differences in terrain and surface features becomes apparent. To avoid interference with the image colour scale, we convert the aerial photograph in the background to greyscale and make the geophysical image transparent to reveal underlying surface features.